The increasing complexity of road traffic makes great demands on drivers. Driver assistance systems relieve drivers and optimise safety on the road. Therefore, modern driver assistance systems are part of the standard equipment in almost all new cars in Europe and pose new challenges for garages. 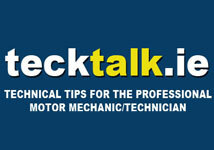 Vehicle electronics today play a key role in all comfort and safety features. The optimal interaction of complex electronic systems ensures fault-free function of the vehicle and thus improves traffic safety. The intelligent data communication of the electronic vehicle systems is supported by sensors. In relation to driving safety, wheel speed sensors are of particular importance and are used in numerous applications in various vehicle systems. In driver assistance systems such as ABS, TCS, ESP or ACC, motor control units use these sensors to determine the wheel speed. Via data lines, the wheel speed information from the Anti-Lock Brake System (ABS) is also provided to other systems (engine management, gearbox and chassis control systems and navigation systems). Due to this variety of applications, wheel speed sensors make a direct contribution to driving dynamics, driving safety, driving comfort and reduced fuel consumption and emissions. Based on their mode of functioning, wheel speed sensors are classified into active and passive sensors. A clear assignment is not defined. If a sensor becomes “active” only when a power supply is connected to it and if it then generates an output signal, it is called “active”. If a sensor works without an additional power supply, then it is called “passive”. The frequencies and amplitudes of the alternating voltage are related to the wheel speed (Fig. 1). Passive inductive sensors do not need a separate power supply from the control unit. 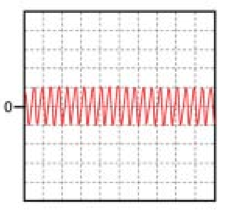 As the signal range for signal detection is defined by the control unit, the amplitudes must be within a voltage range. The distance (A) between sensor and pulse wheel is determined by the axle design (Fig. 2). The active sensor is a proximity sensor with integrated electronics supplied with a voltage defined by the ABS control unit. For the pulse wheel, a multipolar ring may be used and may be positioned in a sealing ring of the wheel bearing. Magnets with alternating poles are installed in the sealing ring (Fig. 3). 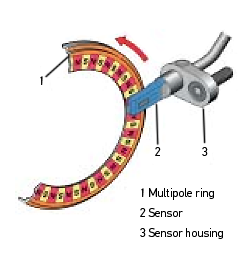 The magneto-resistors integrated in the sensor electronics detect a rotating magnetic field when the multipolar ring rotates. 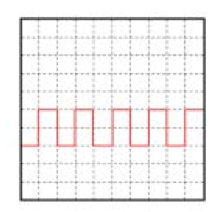 The electronics in the sensor convert the resulting sinusoidal signal into a digital signal (Fig. 4). The signal is transmitted to the control unit in the form of a current signal using pulse width modulation. The sensor is connected to the control unit via a two-wire electric cable. The sensor signal is transmitted via the power supply wire. The other wire is used as an earth for the sensor. In addition to magneto-resistor sensor elements, Hall sensors are also used today that permit wider air gaps and react to the smallest changes in the magnetic field. 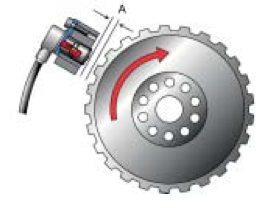 If a steel pulse wheel is installed in the vehicle instead of a multipolar ring, then a magnet is additionally installed on the sensor element. When the pulse wheel rotates, the constant magnetic field in the sensor changes. Signal processing and the IC are the same as in the case of magneto-resistive sensors. Wheel speed detection from standstill. This allows speeds of just 0.1 km/h to be measured which is of importance in the case of traction control systems (TCS) right from the moment of starting. The Hall sensors are able to detect forward and backward movement. The sensor design is smaller and lighter. Pulse wheels are not used, so that the power transmission joints are simpler. Sensitivity to electromagnetic interference is lower. Changes of the air gap between sensor and magnetic ring have no direct effect on the signal. Good insensitivity to vibration and temperature fluctuation.